Welcome to my stop on the Evil Games blog tour! I first discovered Angela Marsons in December 2015 following a recommendation of her books through a Facebook group. Having read the synopsis for the first in the series, Silent Scream, I purchased all 3 as I could tell from the start that they were ‘me’ books. I then proceeded to read the first 2 back to back which is pretty unheard of for me, and then the 3rd book a couple of weeks later. These books do need reading in sequence (and it really isn’t a chore reading them all! ), because whilst the actual story line in each book is standalone, the back stories are important to truly understand DI Kim Stone and her team. Evil Games is the second instalment and was originally published in May 2015, Bonnier Zaffre are now bringing the print copies to the reading world. Whilst Kim is a strong, confident, ballsy woman – she is also still traumatised by her childhood and this is drawn out in this plot. In Evil Games we learn so much about Kim and the demons that continue to haunt her – however a sociopath uses this information as part of her twisted experiments to see how much she can manipulate a situation and sit back to watch the consequences. This book is brilliant and builds upon the brilliant character that Marsons introduced through Silent Scream. This book is such a page turner, I felt that I had full access to the warped mind of this sociopath but was powerless to stop her…..so I just had to keep reading! A fantastic combination of psychology and a murder investigation! Angela Marsons discovered a love of writing at Primary School when a short piece on the rocks and the sea gained her the only merit point she ever got. Angela wrote the stories that burned inside and then stored them safely in a desk drawer. After much urging from her partner she began to enter short story competitions in Writer’s News resulting in a win and three short listed entries. She used the Amazon KDP program to publish two of her earlier works before concentrating on her true passion – Crime. 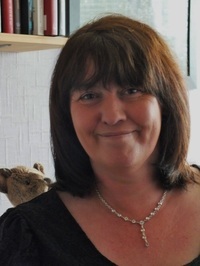 After many, many submissions Angela was signed in a 4 book deal to Bookouture as their first crime author, now Angela is now signed to write a total of 16 Kim Stone books for them and has secured a print deal with Bonnier Zaffre Publishing. I keep adding this author’s books to my “Want To Read” list at Goodreads, but I really should get my hands on a copy of the first book in the series, so I can get involved with the character of ‘Kim Stone’ from the very beginning. Maybe after that, the books might be read as stand alone stories – What do you think?